Ok, so mini workshop part 2 has dropped and is now available on the download page of the Your Amazing 2018 page. It’s just 6 minutes long so go watch it HERE. 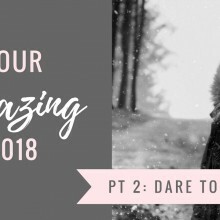 Last week was all about taking a look back to reflect and review the year that has passed and now this week we start to project forward as you get to now create the vision and dare to dream BIG with what you want your life to look like. I have always been a bit of a dreamer and my goals are often wayyyyyyy to big, possibly a bit unrealistic as my husband keeps on telling me. But you see for me, the bigger the dream the more fire it creates in my belly. My dreams have to be big enough to get my booty out of bed at 5am and get working on making my dreams happen. I may not have hit all of them this year (in fact many are waaaaaay off), but damn I am a heck of a lot closer than I was at the beginning of the year. Defining your happy. Get clear on what your happy life looks like, because if you don’t know what it is you want for your life, then how are you ever going to get it? Daring to dream – What are the things that you dream about?? Big or small weird and wonderful, they are your dreams and you get to bring them to life. Prioritise. Look at what’s going to have the biggest impact on your life in 2018 and start to get your goals into priority order. So when you hit January you know exactly what you want to tackle first. CLICK HERE to watch the training and then get your ideas out of your head and down onto paper.